Dentistry improves appearance, overcomes years of fear, neglect and shame for not going, improves health and relieves pain. We promise to do everything we can to make that a reality for you. Explore our site to learn more about available options. Are you missing one or more teeth? Have you begun to feel self-conscious about the way you chew, eat or speak? Dental Implants may be an option for you! Dental Implants are quickly becoming the most popular tooth replacement method and have helped many patients smile and chew with ease! Today’s dental implants are a permanent tooth replacement method. Learn more about dental implants here. Dental implants serve as a support system for dentures that is used when a person does not have any teeth in the jaw, but has enough bone in the area to support implants. 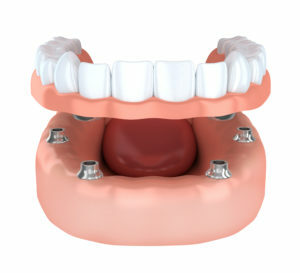 This type of denture has special attachments that snap onto the implants. This is a great option for those who are tired of traditional dentures and are looking for a more secure option. Find out more about dental implant supported dentures. Going back even just a few years, if a patient suffered from a broken, chipped, or cracked tooth- there were not many options for a natural, great looking repair. There also wasn’t much that could be done for patients with discolored or stained teeth either. Now, thanks to the most modern technological advancements, almost any dental defect can be corrected with cosmetic dentistry. These procedures help reduce the signs of aging, correct any damage done, and ultimately leave the patient with a more vibrant and healthy appearance than ever before. Along with gaining a better-looking, more youthful appearance- cosmetic dentistry can also impact how a patient feels inside too. Studies have shown that if a patient has a great smile they love to show off, it can work wonders for their psychological health, boost self-esteem, and improve their overall outlook on life. Who wouldn’t want to increase their courageousness, confidence, pride, and aesthetic appeal, all at the same time? Cosmetic dentistry can be the positive life change you have been looking for. In the same way that all technology develops, as cosmetic dentistry has grown, it has become an option to more and more people. Gone are the days where you would have to visit a major metropolitan center and they were the only ones around performing the top smile-enhancing procedures. At Dental Care of Walnut Creek, we work very hard to bring you the absolute best cosmetic dental care to all of the San Francisco, California region. No community is too big, nor too small to have a smile they are proud of. As cosmetic dentistry has grown and become more accessible to different people over the years, it has also become more affordable as well. While the work performed is necessarily “cheap,” it is well within arm’s reach for most families or individuals to create the smile of their dreams- with our help. In addition, most dental insurances are adding coverage for cosmetic dental procedures that may be needed for structural reasons. We suggest you check with your provider to see if they offer this option. Unlike certain dental procedures that require constant maintenance, return visits, and replacement within a few years- Dental Care of Walnut Creek offers a variety of cosmetic dental treatments that can last 10 years or more! Save time and money by investing in a long-lasting, quality treatment that will leave your smile looking natural and feeling more comfortable than ever before. While it will ultimately depend on the procedure performed, most cosmetic dental treatments have a recovery time that can be as little as an hour or just a few days! Best of all, most patients also report very little pain or discomfort during these shortened healing times. Compared to other procedures, which can take weeks or months to heal, you can see why cosmetic dentistry from Dental Care of Walnut Creek is loved by so many, and why so many patients choose our office to help improve their smiles year after year. My first time here and I was very happy! The front office staff was great and very accommodating. The dental assistants were awesome and friendly which put me at ease right away. Dr Yi was great! He was detailed, calming and had a gentle touch. I would definitely try Dental Care of Walnut Creek if you are shopping for a new dentist! I was just fitted with a temporary crown at Dr. Greenfield's office in preparation for the final crown. I had absolutely no discomfort with the temporary, no sore gums, no dull ache and no tooth pain. It was as though I hadn't had any work done! What a great job to both Dr. Greenfield and his assistant. DCWC has been so popular that they had to upgrade their offices to accommodate the growth and needs of their patients. Dr. Max Greenfield is the best dentist - he's always friendly, cheerful and professional. He is very gentle when he works on my teeth, and is concern about his patients. Anita, his dental assistant is also friendly and observant and noticed that my teeth was sensitive to the cold water.